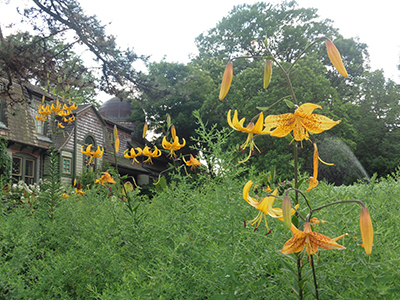 Lilium leichtlinii, commonly known as Leichtlin’s lily, was named after Maximilian Leichtlin, a German botanist who lived during the mid to late 19th century. 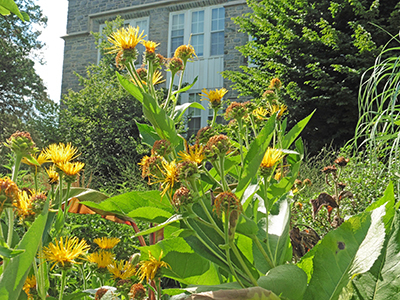 The plant’s golden-yellow, highly reflexed flowers measure 2 inches across, and are easily visible as you pull into the parking lot at the Scott Arboretum. This Japanese native is not particularly fragrant but its ornamental value is compensatory. With mature bulbs producing upwards of 20 blossoms on a single stem, it is rather remarkable that these graceful lilies are able to remain upright. The stems are long and slender, usually reaching 3 to 4 feet in height, and are covered in thin lanceolate leaves. L. leichtlinii prefers sandy or loamy soils, but will generally tolerate any well-drained area that receives full sun to part shade. 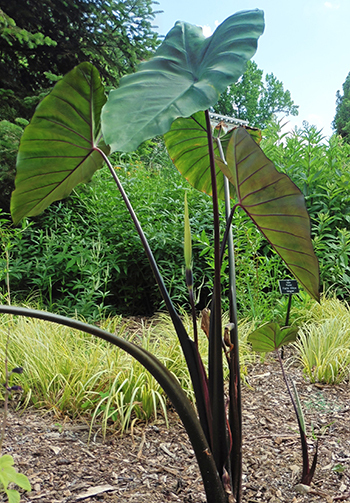 Colocasia esculenta ‘Fontanesii’ is a large tropical species often used in container gardening. Also known as black taro, this attractive plant has dark-green, waxy, heart-shaped leaves up to 30 inches long and dark purple to black veins. The 4-8 foot tall stems are also dark-purple to black and add a unique look to the garden.